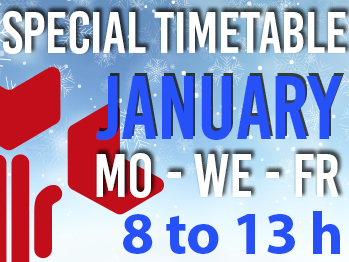 The Direct Sales Room will open exclusively in the morning, Monday, Wednesday and Friday from 8 to 13 hours. This measure responds to the fact that these first weeks of the year are a period of impasse between the already finished campaign of Christmas and the campaign of Spring, that serves to producers and commercials to organize and to program it to offer, already in February, its best offer of flowers and plants. The offices of the Market will open every day, from Monday to Friday, from 8 a.m. to 4 p.m.